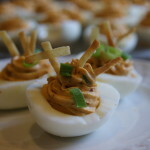 Deviled eggs. 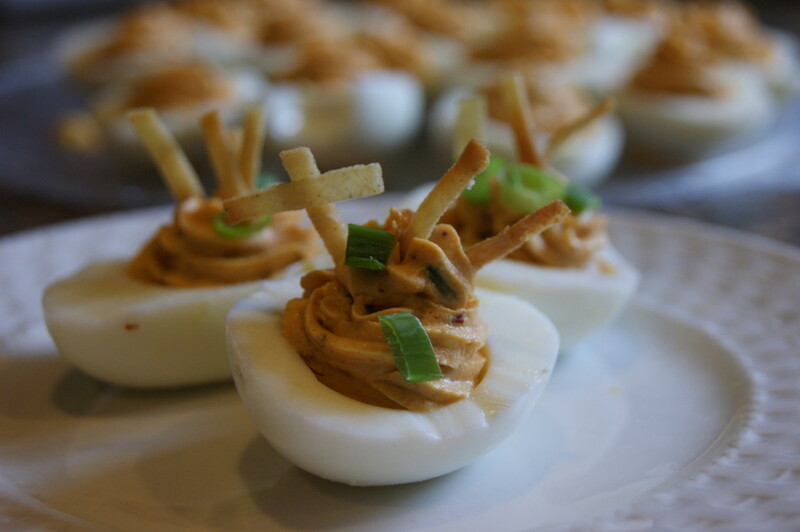 Yes, deviled eggs. Cliche and 80’s – like, I know, but hear me out. We had family in town this weekend and at the same time, we undertook the daunting task of potty-training our oldest son, which didn’t leave me with the luxury of extra time to make a trip to the grocery store to make an appetizer for our family get-together. I had to use what I had on-hand and after surveying the fridge and pantry, I came up with this twist on a tried and true party staple. These Southwest Chipotle Deviled Eggs take an already amazing one-bite appetizer and turn it into a crazy good, smoky, creamy flavor explosion. So, go ahead and make these for your next party. They’re guaranteed to disappear fast. 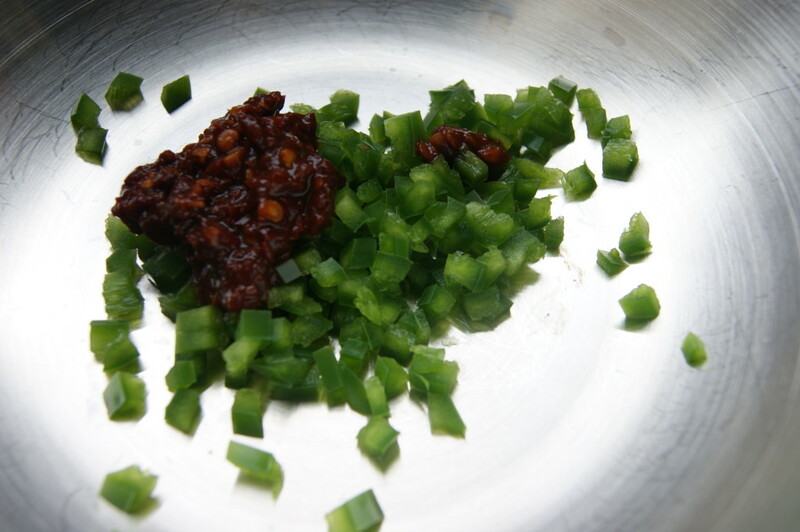 Minced jalapeno and chipotle in adobo..
Cut the tortillas into thin strips for faster cooking. Place eggs in a large pot and cover by one inch with cold water. Bring to a simmer over medium-high heat, then cover. 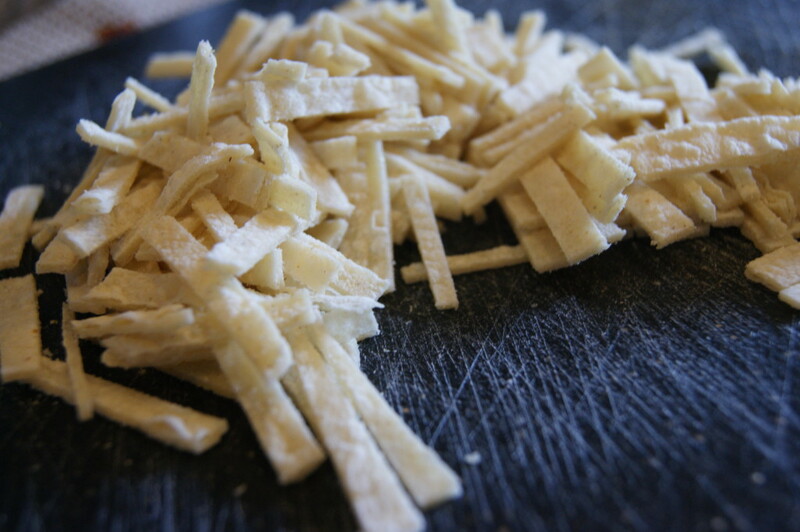 Cook for 5 – 7 minutes, remove from heat and leave covered for another 5 minutes. Drain, cool in ice water and peel. Garnish eggs with crispy corn tortilla strips and green onions. 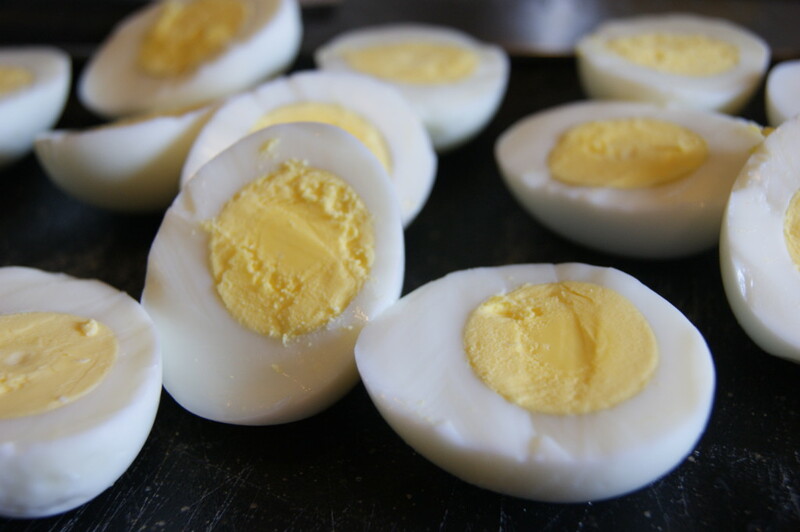 Slice the eggs in half and carefully remove the yolks and place into a large bowl. Set egg whites aside. Add jalapeno, chipotle in adobo, cumin, garlic powder, salt and pepper to the yolks. With a spatula, break up the yolks, while mixing with seasonings. Add mayonnaise and fold until well combined. Refrigerate for at least one hour. Meanwhile, toss tortilla strips with vegetable oil and cook in oven for 5 – 7 minutes until golden brown. Remove from oven, season with a pinch of salt and cool on paper towels. Remove egg mixture from refrigerator and spoon or pipe into egg whites. Garnish with tortilla strips and green onions. Serve cold.